If it’s time to bring your hard floors back to their original glory and you are wondering whether to do the job yourself or hire a specialist, we recommend you go for a cleaning expert. In fact we advise you use our hard floor cleaning and polishing service in Hanwell for a great outcome. 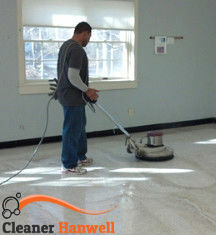 We are known for providing value for money and we will never leave your floors unattended. We use high-calibre equipment and are trained in various cleaning techniques. You will not regret getting a package at our company. Here is our contact number – feel free to give us a ring. We will take the burden of this difficult and burdensome task off your shoulders. You will not be bothered with scrubbing or operating heavy cleaning machines. We will make it seem like a breeze. Our hard floor cleaning and polishing service in Hanwell, W7 uses a few simple methods of cleaning. All in all, we don’t do much scrubbing. We just put our powerful cleaning machines to work. They apply cleaning solution, do all the scrubbing themselves and vacuum all the dirt and grime. It also has to be said that we will bring in our buffing machines, which we use to polish the surface. 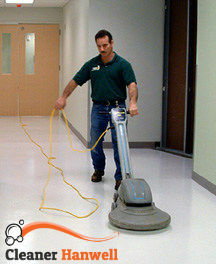 This is an essential step of the cleaning process and it is implemented with precision and smallest of detail. The timeframe of the cleaning varies depending on the size of the area. Overall, we will spend no more than a couple of hours or so on the job. You can be sure that after we are done, your floors will be gleaming, plus, you will be able to walk on them soon after we finish cleaning. It is worth getting our service. We will save you time and problems. Consider giving us a ring.